Altered Goodwill picture and frame. 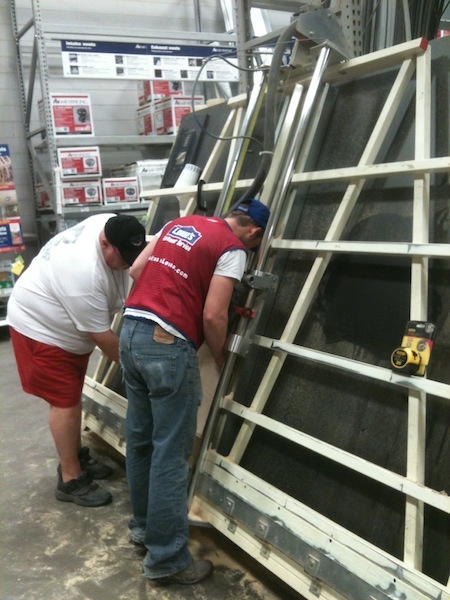 Joe measured the inside of the frames and we went to our home improvement center to have some plywood cut down to size. I found a place in Oklahoma City that sells industrial self healing cork. Much more heavy duty and durable than the stuff I’ve purchased at Hobby Lobby, Michales, Dollar Store, and the home improvement centers. This stuff is expensive but it is going to hold up so much better than the cheap stuff. Joe and I cut the cork to fit the plywood, to my specifications anyway. He administered the contact adhesive to both the wood and the cork. Then we carefully placed the cork in the designated areas and Joe went to town banging on the cork to seat the two surfaces. 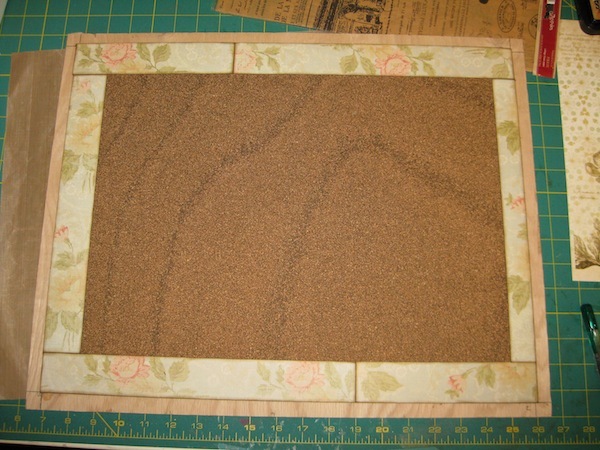 Now it is finally time to do something with one of the cork boards. The papers I’m using are mixed. 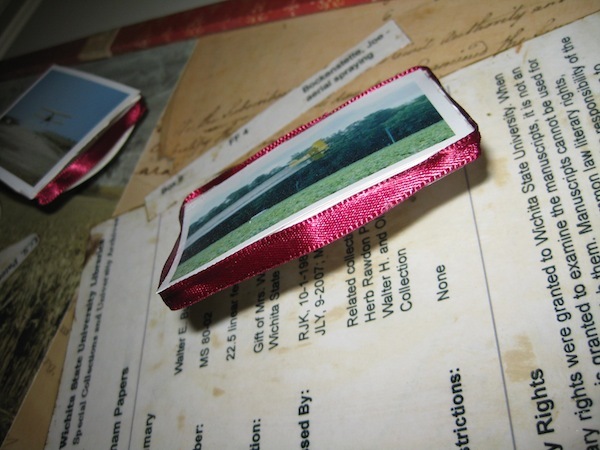 DCWV Family Connections, K&Company Life’s Journey, and Graphic 45 Romantique. 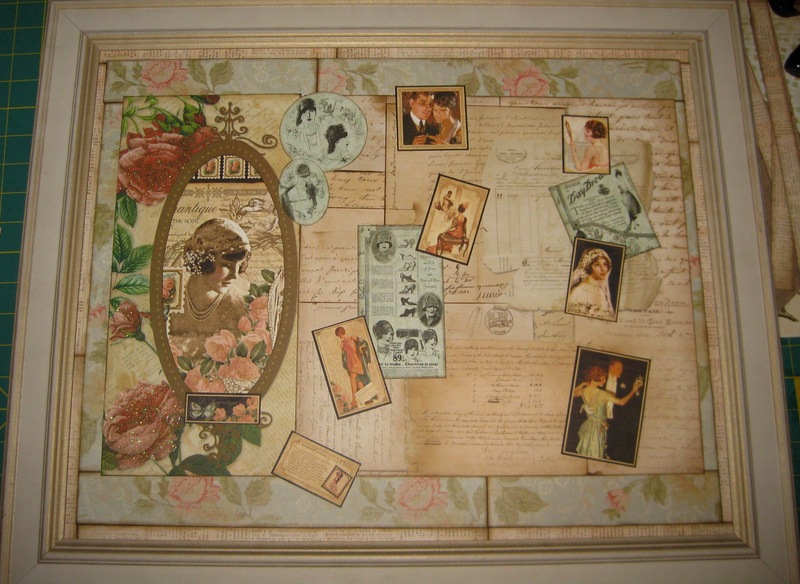 The oval frame piece is DCWV Family Connections, the antique documents paper is K&Company Life’s Journey, as is the border of the roses. 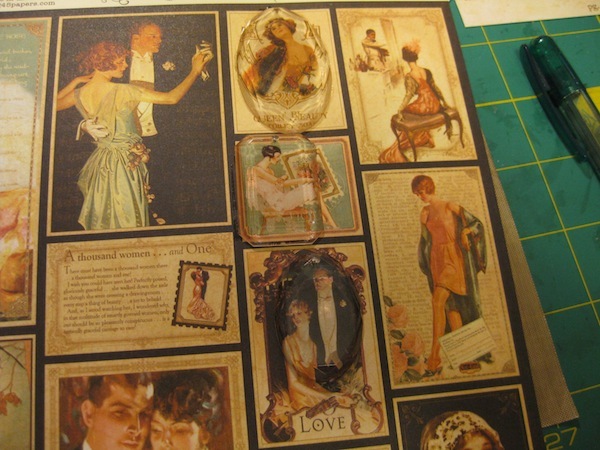 The focal collage (sort of) papers are from Graphic 45 Romantique, as is the bridal image within the oval. I’m thinking of giving this to Carissa. 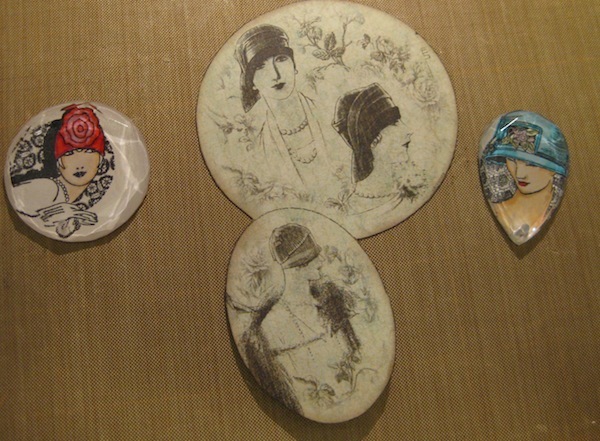 She has some framed art work on her walls of men and women around this time period. The colors are deep red and black so maybe these colors will be too tame for her. I’m also contemplating hot gluing tear shaped pearls strung together around the inset of the frame. The outer part. The white might fade out. I tried black ribbon in the area of the frame and didn’t like it. The bulletin boards I’ve made before I’ve used foam core board for the push pins. 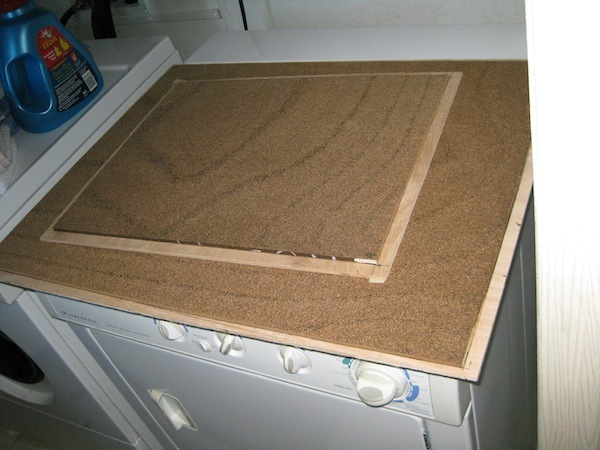 Cover the exposed foam core with ribbon and glue it all together. I wasn’t thrilled with the results then and I’m not thrilled with them now. 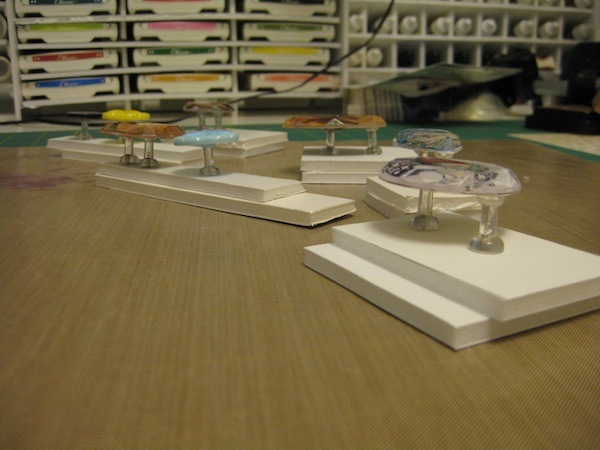 So I’m going to try my hand at coloring with Copic markers and use Tim Holtz Facets for the push pins. This should prove to be interesting. 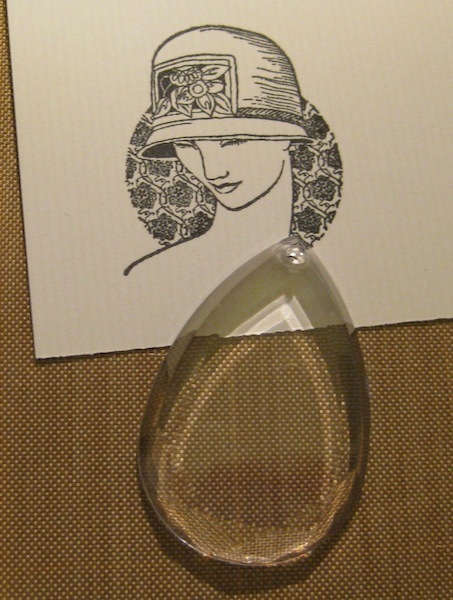 The Graphic 45 Romantique collection has an advertisement for women’s hats. I have used the advertisement on the board now the push pins are going to reference the ad. I had a bit of trouble with the coloring. The Staz-On ink smeared just a tiny bit. 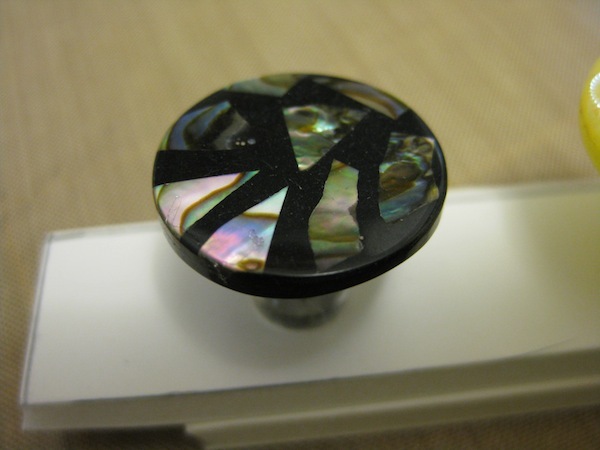 The next push pin tops will be from the Graphic 45 paper and the Facets. The push pins are just some clear things I’ve purchased from Hobby Lobby. 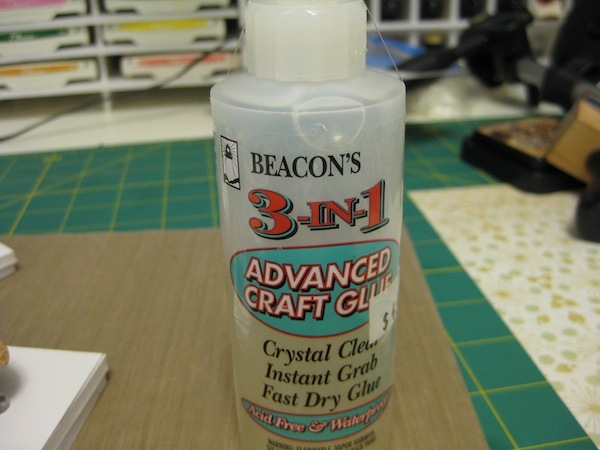 I’m going to try the Beacon 3 in 1 glue to adhere the tops to the pins. 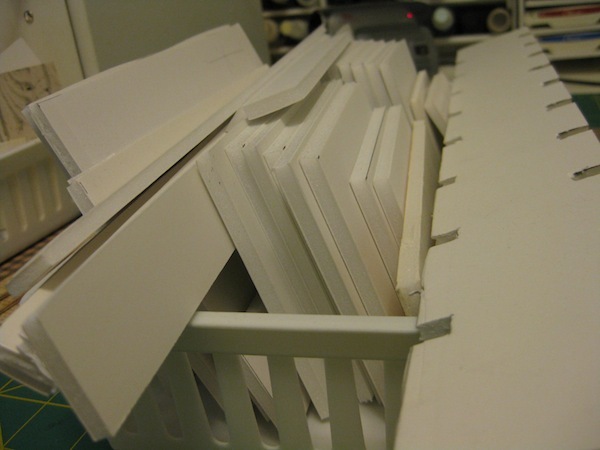 I have quite a scrap stash of foam core board. I’m using it to poke the push pins in and be held upright while the tops dry after they are attached. The support system seems to be working really great. The jury is still out on the glue! 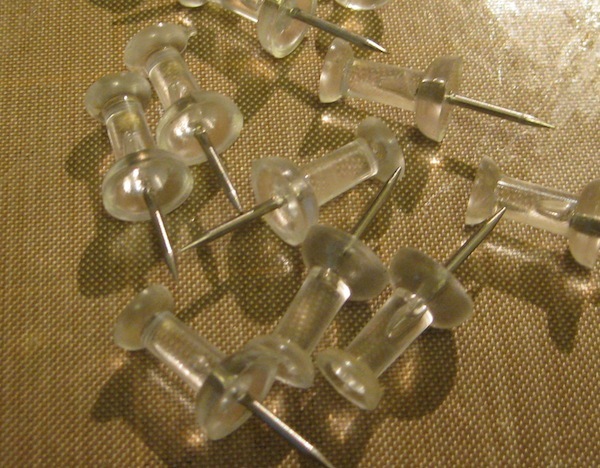 A couple of the push pins will be some beautiful pieces I found in the gift that Shelly gave me. They are not buttons. I don’t know what they are….besides beautiful. So that is the project I’ve worked on today. Are you up to altering a Goodwill find? If you do, leave a link to your blog so I can go see. Previous Tim Holtz Stampers Anonymous “Mini Halloween” Next I don’t know when to stop the tweaking. What a great idea for dressing up push pins and not only making them look nice but fitting in with the theme of the bulletin board. Love the theme you have chosen too. 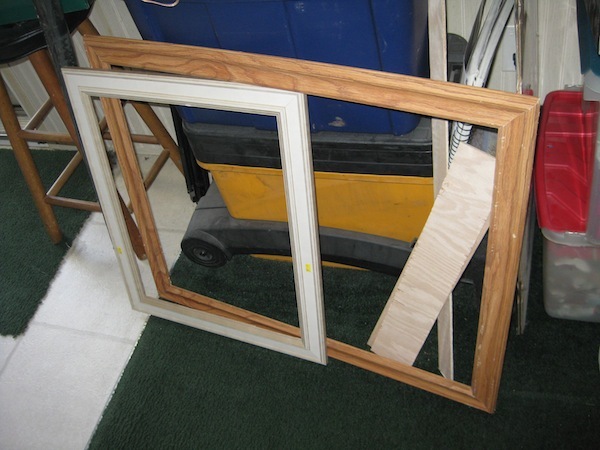 Now if I could find some decent cork I have a few frames and need some inexpensive Christmas gifts – hmmmm wonder if I can fit these into the shedload of projects I want to have a go at????? 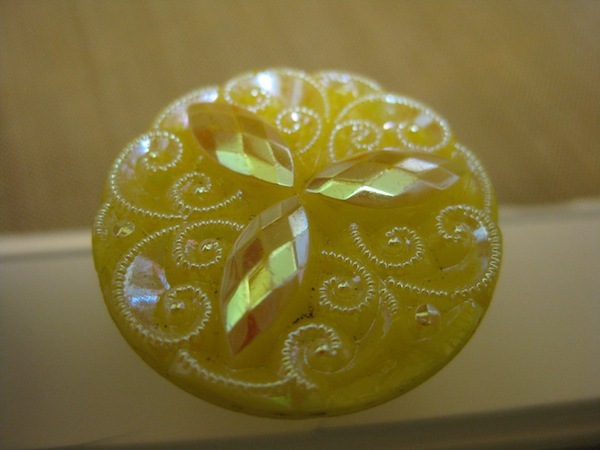 I have a question for you – over here when we want to do 3D decoupage we can use either foam pads (dimensionals) or silicone glue (caulk). Now the cheapskates amongst us go to a DIY outlet and buy tubes of silicone glue to use and put up with the smell which soon wears off. This type of adhesive is better than using foam pads as it is less obtrusive. Now there are several craft companies that have brought out a similar product over that has no smell but has a high price tag. An Ameican lady on a forum I am a member of wants to know if such a product is available in the US but I have no idea nor do I know what name it would go under. Any ideas? I have no idea what a caulk type of adhesive that could be used in 3D would be. The only thing that came to mind was the E-6000. It is a clear adhesive, stinks quite a bit but the odor dissipates quickly. This stuff is some powerful holding adhesive. It gets hold of anything – wood, fabric, paper, glass, ceramic and porcelain, plastic, and buttons are good items to use this stuff on. Especially if you don’t want the item to ever come off! Other than that I have no clue what the product would be. It isn’t the DIy version I want Leslie but the crafting stuff – for use on 3D decoupage/paper tole. 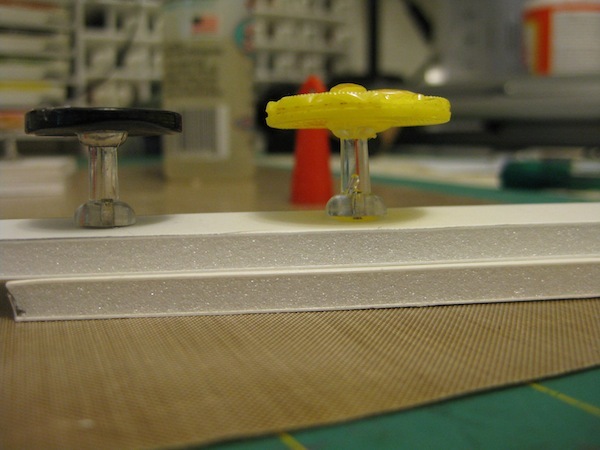 When doing decoupage or paper tole you don’t want everything glued flat so the silicone glue allows you to make small peaks of glue that holds its shape between the layers. This glue is better than using dimensionals as it doesn’t show so much. I just wondered what brand name it goes under in the US and where it can be purchased. I did some research while Joe was in the hospital. Check out my post of yesterday – “Homemade glue dots” – and see if that is what you are referring to. Sorry to be so brusk….leaving town today and I have 10,000,000 things to do.